Visiting Amsterdam is on many people’s bucket lists. 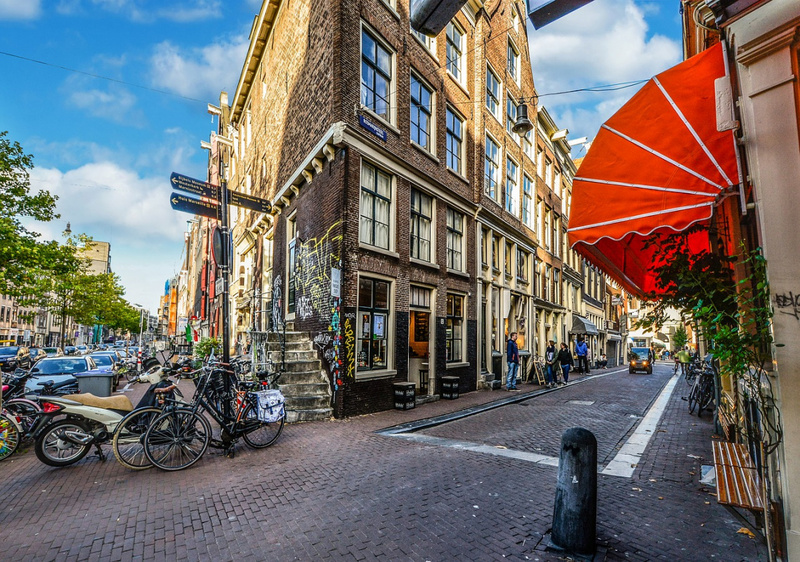 While Amsterdam is a wonderful city, there are some rules that tourists need to follow. Knowing certain things would also make your trip nicer, possibly cheaper and easier. Living in Amsterdam and Leiden (another Dutch city) gave me a perspective on what is unique about the Netherlands. Here are my best tips for visiting Amsterdam. While you can buy a train ticket at the station, you cannot pay for the bus or train in change anymore. If you’re planning on visiting many museums, consider getting an iAmsterdam Card. It gives you access to many museums for free and a ticket for transportation. Alternatively, if you’re not the biggest museum fan, you could just get a public transportation card. 24-hour pass costs €7.50 and you can purchase it online, or at the counter at selected stations upon arrival. IMPORTANT: Whether you’re using I Amsterdam Card, public transportation pass, or OV-Chipkaart, you’ll need to touch a reader once you get on the tram and do it again before getting off. If you don’t do it, it will invalidate your card or charge you 20 Euros. Before crossing the road, triple check all directions as people in Amsterdam pedal through the city at great speed. Never stand in the middle of a bike path, or you’ll be yelled at. Avoid walking in the cycle lanes under any circumstances. You’ll be yelled at immediately and someone will drive into you – and it will be your fault. Never drive on the road. Bike paths are the only place to ride your bike in Amsterdam. Always signal with your arm which way you’re going to turn. You can’t take your bike on a tram or bus unless it’s foldable. If you’re planning on taking your bike on a train, unless it’s foldable, you need to purchase a separate bike ticket for it. You’ll be fined if you don’t. You can’t park anywhere outside of designated spots, if you park in the wrong place the police will take your bike and you’ll have to buy it back for them for 30 Euros. As much as Americans like to pay for everything with a credit card, it doesn’t always work that way in Europe, Amsterdam included. Most machines will only take chip cards (so no AmEx) and many will only accept Dutch cards. In grocery stores like Albert Heijn if you see PIN graag, it usually means that they may only accept cash or a Dutch debit card. As Amsterdam isn’t as big as other European capitals, many hotels tend to fill up quite quickly. Remember to book your accommodation in advance, especially during major events like King’s Day. The weather in the Netherlands isn’t great. In fact, it’s the worst weather I’ve ever encountered (I used to think it rained a lot in London or Scotland, haha!) so if it’s sunny for a few days straight it makes the national news. However, don’t let it stop you. The weather changes every hour in the Netherlands, so it’s useful to dress in layers and bring an umbrella or/and raincoat. Even the heaviest rain doesn’t stop locals from biking around, so it shouldn’t stop you from exploring as long as you’re prepared. Dutch people don’t ever tip at restaurants or cafes. At nicer restaurants you can tip 5-10% if the service was really good, but you’re not expected to do so. Bijbels Museum Cafe (Spui) – Lunch spot. Greenwoods (Canalbelt) – Best eggs benedict. De Pizzabakkers (West) – Great pizza. Dutch food isn’t the best food in the world. Expect a lot of fried and mushed things. 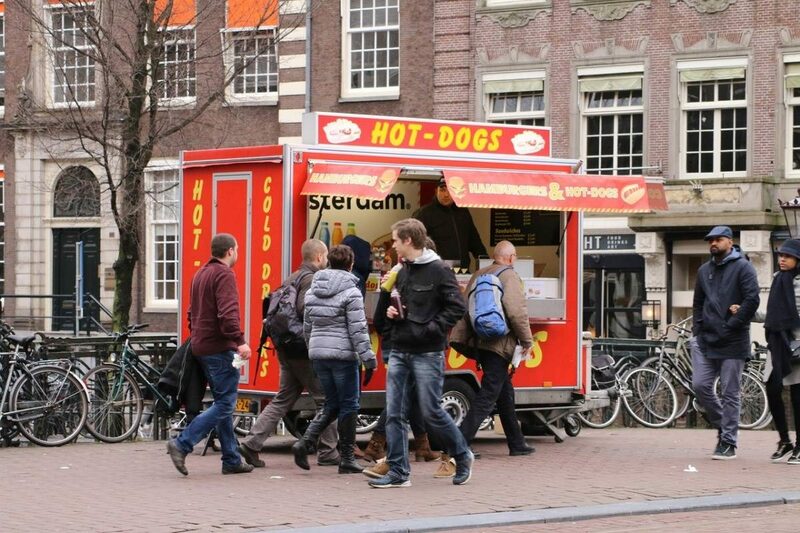 A very Dutch experience would be going for some kibbeling from a street stall or fresh and warm stroopwafels. It is illegal and disrespectful to photograph those working in the Red Light District. Plus, there are plenty of security guards around that might knock your camera down for breaking those rules. 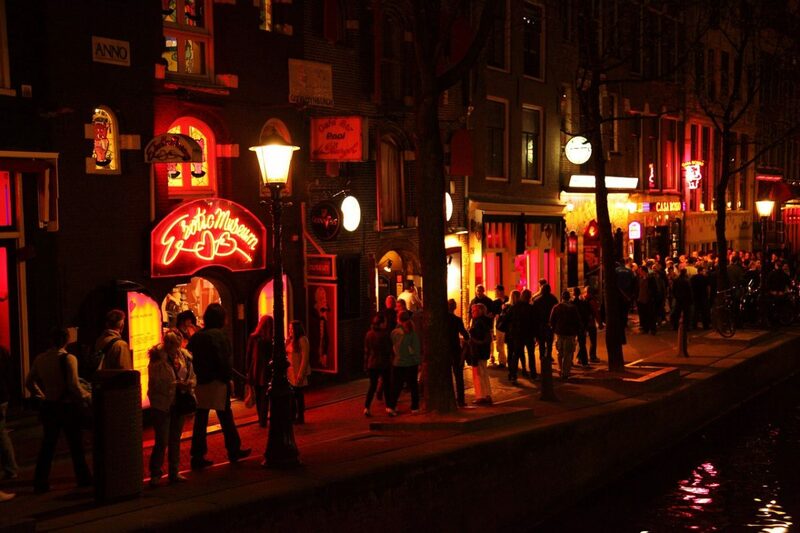 If you’re curious about the Red Light District, but feel intimated going alone, book a walking tour. Note that free tours are currently banned in this area and licensed guides can only take you there before 7 pm. Cannabis isn’t legal in the Netherlands, but it’s decriminalized for personal use. Don’t be obnoxious when smoking weed, especially for the first time. Many Dutch people will get angry at you if you ask about weed and ask that it’s just for tourists. I only had a few local Dutch friends who smoked, most did not. That said, don’t go to Bulldog (Amsterdam’s most famous coffeeshop). For a gram of weed you’ll pay about 15 euros there and the quality is questionable since it’s catered towards tourists. There are some better local coffeeshops like Katsu in De Pijp or Green House near Central Station. Again, if you feel intimidated and want some directions you can always book a tour. IMPORTANT: Never buy any drugs or weed on the street. Not only the cops are everywhere, but there were many incidents with faulty drugs being sold around the city. 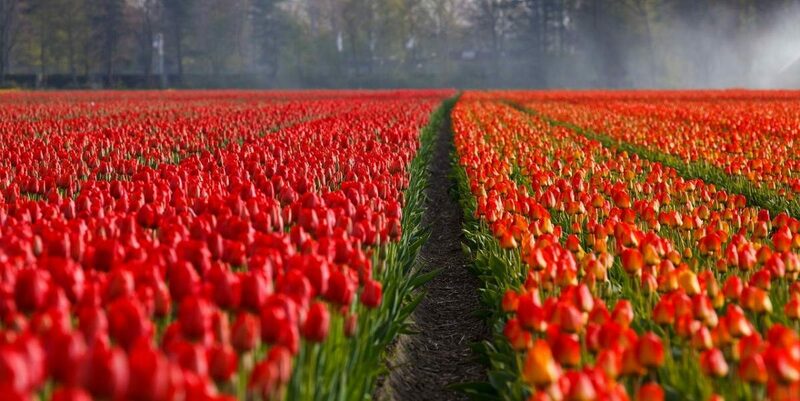 If you’re coming to see the tulips during the tulip season (April-June), remember that tulips aren’t actually in Amsterdam! That said, neither is Madurodam, so if you want to see those place save at least half a day for each attraction. 13. See More of the Country! Don’t be that tourist that stays just in Amsterdam. Many tourists just get stuck in the center and miss the surrounding neighborhoods and the country itself. 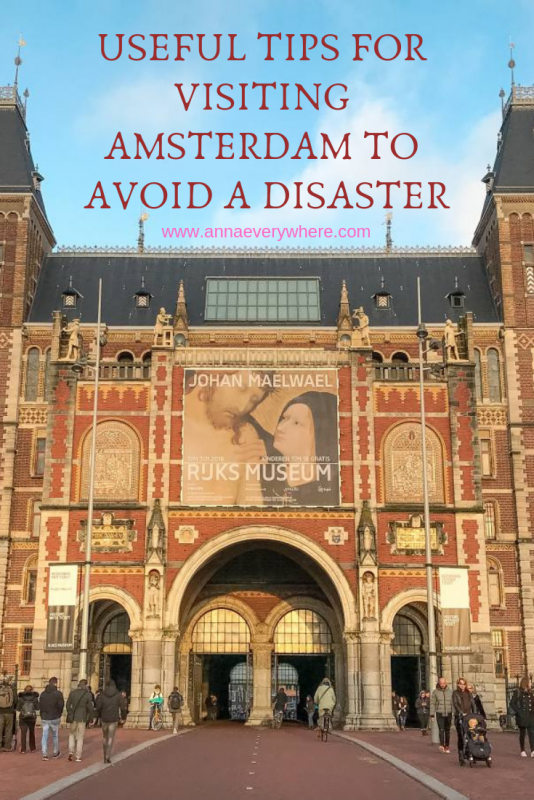 There are many spots that you can see on a day trip, or if you want to experience more authentic spot than touristy Amsterdam and see how locals live you might want to spend a night in smaller towns like Haarlem, Leiden, Delft or Utrecht.